Do you prefer a quiet float down a scenic river? If you need less adventure and more of a relaxing day on the water, Hard Water Sports can help pick the perfect river tour for your group. 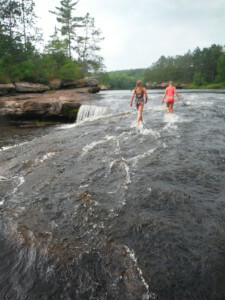 Float a kayak or canoe through 2 miles of Banning State Park to Minnesota’s best kept secret. Rent a canoe or kayak and we’ll take of the shuttle and provide a map to adventure. An easy upriver paddle from Robinson Park brings adventure seekers to the Heart of Banning State Park. Rent a canoe us and we’ll give you the details for getting to Wolf Creek Falls and beyond to one of Minnesota’s most notorious river rapids, Hell”s Gate. The first step is to contact us and book the adventure, from renting a canoe for a day to our fully guided and fully catered day on the river.